The explosion of print culture that occurred in the United States at the turn of the twentieth century activated the widespread use of print media to promote social and political activism. 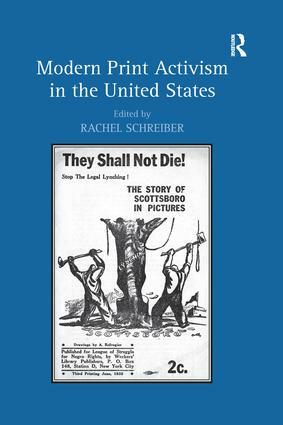 Exploring this phenomenon, the essays in Modern Print Activism in the United States focus on specific groups, individuals, and causes that relied on print as a vehicle for activism. They also take up the variety of print forms in which calls for activism have appeared, including fiction, editorials, letters to the editor, graphic satire, and non-periodical media such as pamphlets and calendars. As the contributors show, activists have used print media in a range of ways, not only in expected applications such as calls for boycotts and protests, but also for less expected aims such as the creation of networks among readers and to the legitimization of their causes. At a time when the golden age of print appears to be ending, Modern Print Activism in the United States argues that print activism should be studied as a specifically modernist phenomenon and poses questions related to the efficacy of print as a vehicle for social and political change.